One official cautioned there is not yet a definitive U.S. conclusion about Syrian intentions based on this intelligence, but there is an effort to gather corroborating information and better understand what the regime may be up to. National Security Council spokesperson Bernadette Meehan issued a statement Tuesday evening saying: "We continue to review and assess the completeness and accuracy of Syria's declaration to the OPCW. However, in accordance with OPCW regulations, Syria's declaration is confidential, and we will not publicly discuss its details or our assessment of it. For further details, we would refer you to the OPCW." Officials told CNN the new intelligence is related to stockpile inventories and delivery systems, such as warheads and artillery shells - items that could preserve Syria’s ability to use chemical weapons again if it chose to. Officials believe al-Assad will hold on to some of the chemical weapons largely as a long-term hedge against what he sees as a threat from Israel. “It strains credulity,” one official said, to believe he will readily give up his entire chemical weapons program. Officials would not say exactly how the latest intelligence was collected. But much of U.S. intelligence about Syria comes from satellite imagery. Also, there have been communications intercepts in the past that have given the United States clues about the intentions of the Syrian leadership. And U.S. officials have in the past confirmed channels of information from operatives on the ground who work on behalf of the Syrian opposition or other countries in the region. Al-Assad may try to hold on to more than just weapons. Last week, Foreign Policy magazine reported that Syria's foreign minister had asked the OPCW to spare a dozen of Syria’s chemical weapons factories from destruction so they could be converted into civilian chemical facilities. Asked about that report Friday, State Department spokeswoman Jennifer Psaki said it did not appear Syria had submitted a formal request to OPCW. "The OPCW would then consider any request,” Psaki said. 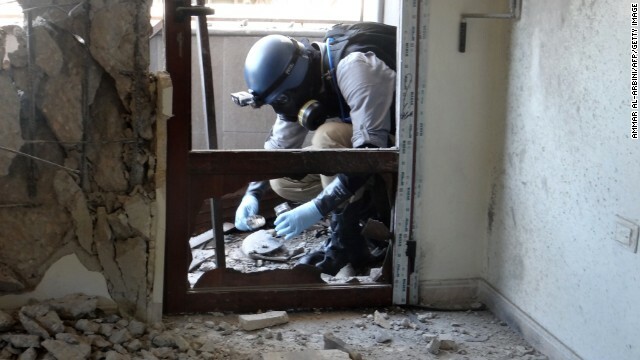 “However, as you know, the (U.N. Security Council) and the OPCW Executive Council decision made clear that Syria’s chemical weapons program must be eliminated." Asked about the Foreign Policy report, a U.S. official said, "there's a real concern that the Syrians might be trying to preserve some of their CW capabilities." The new intelligence is not related to Syria's reported desire to keep some of its chemical factories. The OPCW has endorsed shipping chemical stockpiles out of the country for destruction because of the ongoing conflict there. Discussions on finalizing a plan are expected in the coming days, according to the organization. The OPCW had previously announced the destruction of production equipment at all declared chemical weapons production, filling and mixing facilities. According to the OPCW on Tuesday, 21 of the 23 sites have been inspected. The items from the other two – inaccessible because of the conflict –were moved to accessible areas and verified against disclosure statements made by the regime. The OPCW also said 154 warheads have been destroyed by the Syrians. Destruction work has begun at five other sites which the Syrians say hold 424 bombs and 63 warheads. Norway had considered a U.S. request that the Scandinavian country take some of the chemical weapons inventory for destruction. But last month, the Ministry of Foreign Affairs announced it rejected the plan due to “time constraints and external factors” such as regulatory requirements. So far the United States has provided $6 million in assistance to the OPCW efforts, including 10 armored civilian vehicles to transport inspectors inside Syria. Hagel was referring to the Field Deployable Hydrolysis System, a series of containers full of high-tech equipment that can be sent into the field. Rather than use the typical incineration technology to destroy chemical agents, this system neutralizes the chemical weapons by mixing them with water and other agents. One concept is to send the system to a third country, where the Syrian chemical weapons would also be shipped, a Defense Department official said. The Pentagon is currently analyzing what would be needed to put the chemical weapons on a ship to transport them to a third country willing to accept the material for destruction. The concerns are both how to keep the material stable during shipment and providing maritime security for the transit. "US intelligence suggests Syria MAY hide some chemical weapons"
Just shut up already. Who cares what they are hiding? They can hide Obama's mama for all I care. I just wanna see the war. Bleed you Syrian pigs. I don't care if you're a moderate rebel, government soldier, Kurdish soldier, extremist or jihadi I just wanna see you all being blown up like ballons. Die!Die! Hahaha. Of course Assad is going to hide some chemical weapons! Think about it.... these weapons aren't huge, don't put off radiation and can be buried anywhere to be retrieved at a later date. There is NO DOUBT Ba'athist Syria is going to hold on to some chemical weapons and I would say a good chance they will use them again, of course they will blame the opposition when they do though. Thank you, JerseyJeff. Spoken like another lame brained, hillbilly Tea Partier from the South! Are you one by some chance? Quick! Someone give Obama a marker so he can draw another "Red Line". Go ahead and make it a permanent marker, he'll just blame "the world" for the "Red Line". Well duh! Guess CNN just figured it out. I guess you can't edt comments, and it's long lost in the thread. I think the uniform is awesome. It helps fund a great project, the Wounded Warriors. So what if the red appears blood-like? How is that offensive? When people get injured and bleed, it is red, sorry to shock any of you children out there But it's not glitter and unicorns don't fly in to save you. The uniform is artistic and expresses patriotism while contributing to a good cause. I'm not a fan of this team, hell, I don't even like football, but I think whoever created the uniform is talented. These uniforms will prob be worth some cash someday. What has this to do with either Syria or the right-wing thugs in Washington Oahu, may I ask? I doubt that whichever the color of a football player's uniform is will have any effect on Syria's civil war! I think that you're blogging in the wrong post. Gee, who couldn't see this coming? Oh yeah, everyone with a brain. Which leaves out every miscreant in the Obama regime. What's even better, Obama allowed Assad to do this since Obama gave Putin the go ahead to allow Assad to hide his weapons. Good grief Steve, do you really fall for that right-wing propaganda coming out of Washington D.C.? If you do, then I have a bridge in Brooklyn, NY that I'd like to sell to you! More seriously, don't you remember George W. Bush and his henchmen lying to all of us about Iraqi WMDs some ten years ago? Those creeps in Washington are only looking for another excuse to drag us into another one of their wars!!! Good point. And let me see if I have this right: Syria can hide its WMD and it looks they are doing just that. So… Syrian WMD’s…..hidden. But now “stone cold dead but use to be alive” Saddam Hussein would NEVER, EVER have hidden HIS WMD at all ...anywhere...for any reason. All those liters of Anthrax, Saran, Mustard, etc.... ...those WMD’s that at some point in history REALLY WERE IN IRAQ and that were cataloged by the UN inspectors and other agencies, ….those WMD’s….the IRAQI WMD’s….the ones WE KNEW ABOUT and could track…that is, until the Iraqi's threw out the UN inspectors in 1997 (thank you Bill Clinton and Ms. Lewinsky).....all those IRAQI WMD’s….just didn't exist and Bush, and 17 other nations, all “lied” about them...right? So just thinking about the “current common wisdom” there is ABSOLUTELY POSSITIVELY JUST NO CHANGE AT ALL …EVER….IN ANY WAY… that they were hidden just before the Iraq War started in, oh I don't know...MAYBE SYRIA….that is just wrong. Syria can hide their WMD’s and it looks like they are. Iraq would NEVER HIDE THEIRS.....ever....because, you now ...."Bush lied". Does that about sum up the situation??? Hmmmm.......For some odd reason, I am finding it just a little difficult to believe… How about you?. TD01. This looks like a job for team merika world police. Its time to drop some 500 pounders of democracy on them! Why is this any surprise? The ones he didn't declare were all trucked out of Syria into Lebanon for safe keeping. CNN reported just weeks before the inspectors arrived that convoys of trucks were spotted by satellite leaving Syrian weapons sites. Where do you think these convoys were going? What do you think they were loaded with? Humanitarian supplies for refugees in Lebanon? "Mission Accomplished" – AGAIN! We don't need anymore "missions accomplished"! Well gee wiz, you may just be correct! Syria may hide some chemical weapons ??? Our Secretary of State Vladimir Putin has fix this matter. "I" The OBAMA have spoken !!! Guilty if you do and guilty if you don't. The world is determined to turn Syria into another Libya. Remove the only person who can keep peace and allow chaos to reign. Allow old wounds to resurface and for lives to be lost. Provided that Saudi Arabia and Qatar get their pipeline through Syria. Russia alone can't save Syria and Assad from the inevitable. I can not believe the audacity of cnn, when you compare the tone of the same story on any other, nbc, abc, international press... it isn't' ...speculation, its facts. – I would think anyone that considers themselves a serious journalist would run from cnn so fast... that's why kids work there. Kids, take it from a wsj veteran, this is not journalism. its not even close. its journalism if the history channel is film making. Haven't the US done enough damage to this once beautiful country? Please its time to let Syria be. Enough of this geopolitical squabbles by the super powers with the lives of innocent Syrians. sometimes I think you and I are the only ones that see this for what it is. well we can pray. Go BACK TO AFRICA IF YOU CAN"T RESPECT THE USA!!!!!!!!!!!!!!!!!!!!!!! I agree. Let the Syrians slaughter each other. Everyone else can stay out until they are done. As you wont be informed by your local media mafia – let me put you in the picture : Syria does not have a civil war. They are fighting your own sworn enemy – Al Queda affiliates and Islamists – who are funded by Saudi (originally Qatar – pronounced 'Gutter'), hosted by Turkey, trained by your own Al CIAda, Marines and Mossad, armed by Saudi, Israel and USA via destroyed Libya. ie. Syria are fighting a de facto proxy army of mostly barbaric jihadis ... as per the Pentagon plan on behalf of those bastions of human rights – Israel and Saudi. As per the destruction of Iraq and Libya – the objective is to balkanise all of the once strong, independent middle east nations – and leave them as small, weak, eternally fighting sectarian states .... and wonderful breeding grounds of more jihadis for use by US in it's War oF Terrorism across Central Asia and North Africa. No doubt this truth will be censored. Good posting, Africa Child. Just ignore these narrow minded, Tea Partying fools here who don't agree with us! They always think that the U.S. government is right regardless of the obscene butchery caused by those ungodly drones!!! "...To lose US citizens on a terror attack versus a geostrategical benefit of billions of dollars, for sure, they will take the second one..."
It's a non-existing "choice"... You see, licking the terrorists' behinds will not make them any more peaceful. To the contrary, it will prove that terrorism works and that more terrorism will bring more pleasant behinds-licking. This is excuse that United States wanted to hit Syria , the United States of America is in the help of terrorism. How many languages can you say "Duh!" in? Can you say something... well, intelligent instead? Using English? Honestly, all media in the United States, and most likely globally, is giving invalid information regarding what is truly occurring in Syria. This is a war based on religion; extremist groups are trying to overthrow Bashar Al -Assad in order to implement a religious government. Innocent civilians are having their houses broken into by these extremist "Free Syrian Army" members and are given two choices; either to convert to their religion or be shot point blank if they refuse to convert. Syria has crumbled into ashes and rubble. The beauty this country once had has been crushed by the rubble that now exists due to the violence and tragedy occurring. What blows my mind is how Syria is in need of help, yet the rest of the world is just sitting back and watching. Millions of people have been displaced from Syria; having to risk their lives by crossing the border to neighboring countries and applying as refugees. The reason I know all this? I have family members currently living in Syria, who are living this horrific reality. Gunshots and the sounds of bombs have become a norm for them. They fear for their lives everyday, and pray that they wake up each day and survive. My grandmother's life was at risk while attempting to flee the country. She had to hire a taxi driver to transport her from her village all the way to Lebanon. They passed several check points, and pay off and bribe the the Free Syrian Army members with money to let them through. My relatives were unable to drive to the hospital in Aleppo to get their five year old son his need medication and chemotherapy treatment because the roads were so dangerous. Food is scarce, the cost of living has quadrupled, and everyone fears for their lives. Life and death decisions are made on a daily basis. You either risk your life to go out and get resources/supplies or risk your life staying at home in fear of having a bomb go off in your village or having your house raided by the Free Syrian Army. All my family and I can do is pray for peace in Syria and the Middle-East and that the violence and slayings of innocent people comes to a halt. I pray that God help the innocent people and that some country, or even the United Nations, steps in to end this violent and insane chaos. What exactly can some country, or even the United Nations, DO to "step in to end this violent and insane chaos"? Help Assad against the rebels? or help the rebels against Assad? UNfortunately, BOTH choices will bring more of the same violence and chaos. Your point of view is also very valid-no matter what we do we can not change the mind set of those who could care less about humanity. 2. USA could censure it's master – Israel for arming these terrorists (and demand that Israel too submit to destroying its nukes, biological creepy stuff, chemicals and plutonium etc stocks – that are used quite regularly in the genocide of Palestinians), There should also be censure and ICC trials of the now ? ?>5 unprovoked attacks on Syria by Israel ... always whining and covering up it's criminal aggression with some excuse of arms for Hammas / Hezbollah – which only cretins believe – as Israel is KNOW to be a genocidal, criminal mega-aggressive rogue bunch of illegal racist settlers continually posing as victims whilst perpetrating never ending atrocity by it's apartheid-on-steroids regime!! 3. USA could censure it's big buddy Bandar Bin Sultan of Saudi for bankrolling this war – and frog march him to the ICC for aiding and abetting the ostensible enemy of USA- al Queda and terrorists. AND ABOVE ALL – US CAN START OPERATING AS A LAW ABIDING MEMBER OF THE WORLD – STOP SUPPORTING TERRORISTS – STOP PROPPING UP THE WORST REGIMES IN THE MIDDLE EAST WHILST ACTIVELY DESTROYING THOSE WHO DO NOT MERIT DESTRUCTION! Thank you Hanna because your story sounds genuinely first hand account. Allow God the Creator to bless your tragedically bruised hearts with his peace, togeather with all Syrians who are being subjected to this unneccesary trauma. Some of us mankind make life unpleasant for everyone when aggrieved! I lost faith in the so called free Syrian army when i heard about a combatant who called on the name of Allah when cutting out and eating a goverment Soldiers heart! I appeal to Folks commenting here to do so with facts in hand. Lastly i appeal to all Syrians to bear in mind the words of God which say "Love thy neighbour as you love thyself", because the God of truth says that is the command we should live by/with. But they CAN'T be hiding any chemicals, they just CAN'T. They are honest and trustworthy people of their word. Only the bad USA does stuff like that. I sincerely believe they don't have any and won't harm anyone because they are good people with only kindness and good intentions for all. There is UN working and shouldnt american lawmakers worry about reducing the debt and putting pressure on Assad and the rebels to come to peace? How exactly would you suggest to "reducing the debt and putting pressure on Assad and the rebels to come to peace" AT THE SAME TIME? What about the thousands of civilians who are dying in Iraq from the sectarian violence? Fix IRAQ first before you interfere in SYRIA. Syria was peaceful before the USA starting arming these Syrian Sunni Jihadist Al-Qaeda rebels. USA = warmonger and troublemaker. There's something called "plausible deniability". Of course it was! ALL Arab countries always were peaceful... It's the bad America, Israel and other Arab and non-Arab countries that make the Arabs violent. Does anyone think that Syria is going to give up all of their chemical weapons? If you do. You are a fool. C'Mon. Think about it. I certainly know better. If no one else does, well then you are a politician and a meaningless POS. Syria hiding chemical weapons? Duh. You think? IRAQ was hidding Chemical Weapons. dont you remember? I do. Not only ws Iraq HIDING chemical weapons, it was USING them... and just like Syria was doing just a couple of months ago Iraq was DENYING even having chemical weapons. Also, time to hit ISIS. In other words the US did not get what it wants from today's meeting with the Russians in Geneva and decided to play dirty again. You would think that the US should be pushing for removing Al-Qaeda from Syria but instead it is just playing the same dirty war threats as this is how Obama and his Israeli friends can terrorize the region and the world if they don't get what they want. I wonder who controls Al-Qaeda after all. Hmmm. 1- The US is actuallyresponsible for bringing and maintaining such a dicatorship in power, and since his parished father. 2- There has not been a better servant to the US and Israel, kept a peaceful border with Israel for 40 years, interigated Alqaeda prisoners on behalf of the US, freed US captives in Iran and Lebanon, ........teh list is too long. 3-It is in the best interest of the US and Israel for this regim to stay in poer because they can keep slapping him whenever they want. Nidal Malik Hasan was a United States Army Medical Corps officer. He served in the US Military for 21 years. Then he shot 45 people, killing thirteen of them. By your logic he should get off easy because he served his country in the armed forces. Oh Boy, Another War. Let's draw attention away from the Obamacare Mess! No surprises here. So is there going to be another red line drawn in the sand? Of course they're hiding stockpiles. If it is officially found to be so, Assad deserves to be bombed relentlessly and the Russians stay out of the way. This battle matters. As much as it is against our short term goals , our long term goals demand assad crushes them. Assad is going to survive this civil war, because it turned into an international gihad. We should be getting those moderates we wanted to arm out. We don't need to worry about this intel , we need to ensure when assad meets his obligations we and russia see that he crushes the gihadi's. Reality is he didn't necessarily gas his own people, he gassed an invading army with no uniform who hid among moderates we favored. He can face those charges later. Destroy what he declared and ensure he crushes the gihad with brutal efficiency. They are naturally condensing into a small area. influence the moderates to flee, ensure everyone there is gihadi. Cut off the escape routes and destroy them. Then when world peace is not in jeopardy he can answer for his crimes. You can't let him lose at any cost. Dont I sound just like RT and Presstv? I should work for them. Check this out "Syrian rebels use CW against their own people and themselves, so that US can invade the Syria and bomb it?" Doesnt make sense does it? Wouldnt rebels who are fighting Bashar for so long use such a great military advantage against assad? Yeah, the Al Qaeda and Salafi groups are hiding their chemical weapons. I think we should worry more about the United Stated itself period. The United State has created so many conflicts around the world and it is about time they give it a rest; they are technically broke and can't even support their Dollar if the truth be known. No country would be stupid enough to claim its entire stash of weapons, but little by little it is usually found out. The guilty ones always give themselves away. I laugh at such attempts, it is like criminals give you their weapons with no charge, got their info that is all you need. Syria LIED to Obama? Well, he's lied to everyone else, so that's cool. The Arabs lie worse than obama, and that's pretty amazing. Shoot all of them, don't ask questions or listen to a thing they say. Did anyone think they wouldn't hide any chemical weapons? Really? Just MORE LIES from the 'friends of Syria' terrorist supporting governments! check out Live Leak and its back catalog of videos that expose and show all the CRIME EVIL that the MSM never shows! We are being lied to, as usual! Just a week or two before inspectors where scheduled to enter Syria, CNN reported (right here on CNN) that US satellite photos showed convoys of trucks leaving Syrian weapons sites!!! Satellite "intelligence" did not determine the destination of these convoys! Come on! What do you think these convoys were moving? "Couldn't determine the destinations?" If this is true, our satellite surveillance system isn't working very well and should have been backed up with high flying drones. Of course Assad moved his "best stuff" before the inspectors came in! Who can even suggest otherwise? All "we" accomplished is to do Assad a huge favor. We got rid all his old and out of date weapons that would never be used anyway! Dropping an old bomb which failed to perform just wouldn't be very smart, would it? All the newer "good stuff" is safely hidden away! Now Assad doesn't have to worry about duds with Syrian markings being put into play! Another lie we have been told recently: Syria's chemical weapons have now all been destroyed! CNN reported this recently! Now, this story tells us that the weapons have NOT been destroyed and still remain in Syria with no place to go! We destroyed "some" of his production facilities, but not all! Assad is asking to keep a few to convert to "peaceful purposes"! Okay, he can hang a big sign over a few facilities declaring these to be drug manufacturing facilities – NO drones allowed! After making aspirin tablets for a few months they can be quickly converted back to chemical weapons manufacturing. All of this appears to be just another "Mission Accomplished" statement! Remember the last time we heard these words? The "mission" was a disaster, nothing was "accomplished" and a 10 year useless war followed! We fought and died, sold our country into huge debt for a people who now like Iran better than us! "Mission Accomplished"! Come on. A few months ago Obama was furiously beating the drums of war. Is this the same Obama who said, for the last 18 months he WOULDN"T send US troops? The same Obama who mere threat of force caused the Russian allies of Syria to broker a cease fire? The Same Obama who is now watching the Syrians account for, and destroy their chems? Is THAT the Obama you are referring to? What US government worries about is what they are to say when their pet terrorists use chemical weapons again! FOOL it was the disgusting FSA=Foreign Salafi Animals who did the Chemical attack on Gouta all the evidence is here! Why must Syria destroy its weapons of mass destruction and Israel does not have to destroy theirs (at least 8 nukes). EIGHT nukes???? LOL. Israel has hundreds. "Why must Syria destroy its weapons of mass destruction and Israel does not have to destroy theirs ...?" Simple, Charlie. For the very same reason cops are allowed to carry guns but violent criminals are not. Thank you, Tom. I couldn't have said it better! where is the like button gone, agree with you. I have visions of Charlie Brown attempting to kick the football while Lucy holds. Assad is Lucy. Obama is Charlie Brown. They guy's a mass murder......he doesn't exactly get the "Trustworthy Chap of the Year" award. So, looks like Defense special interests need to get more money from Congress so we can do a limited strike on Syria to destroy the infrastructure necessary in order to access the 'hidden' chemical stores there. ROTFL... We can't just blow up the chemical weapons you know. Thus the United States can go further into debt overall while the middle class continues to shrink, Obamacare continues to fester, and the filthy rich continue to get even richer not just protecting our homeland but continuing to protect the entire world. I bet the Romans would have loved to do so much. Well put, Susan. Thank you. The Syrians are doing everything they allegedly said they would do? SHOCKING! SHOCKING! And what about this point in the article: "However, in accordance with OPCW regulations, Syria's declaration is confidential, and we will not publicly discuss its details or our assessment of it. For further details, we would refer you to the OPCW." "Confidential" to whom? So, WE can't even know what they declared? What kind of nonsense is that!? AND: "The items from the other two – inaccessible because of the conflict –were moved to accessible areas and verified against disclosure statements made by the regime." So, we are to take them at their WORD! How meaningful is that! This is all nonsense, and since Obama got punked by Putin on the issue, we're not likely to hear much from the administration, until the next embarrassing chemical attack. Meanwhile, thousands continue to die the old-fashioned way! It's so taken care of! Just as meaningful as condemnation from a country that committed one of history's worst genocides I would guess. What genocide are you talking about? He said he would destroy all the chemical weapons he "disclosed"...........I believe him. I just worry about the ones he didn't disclose. The ones he didn't declare were all trucked out of Syria into Lebanon for safe keeping. CNN reported just weeks before the inspectors arrived that convoys of trucks were spotted by satellite leaving Syrian weapons sites. Where do you think these convoys were going? What do you think they were loaded with? Humanitarian supplies for refugees in Lebanon? "Mission Accomplished" – AGAIN! We don't need anymore "missions accomplished"! Silly CNN. The US bought the chemical weapons the opposition has. Who cares. If the people can't even control their own government and country then who cares.... Oh wait I live in America. Who guesses that another chemical weapon attack will happen within a year of this? Perhaps one of these days the USA will declare all our chemical weapons stockpiles...but such information is classified. Yes. US Intelligence. The perfect group of people to determine how likely a country will be to lie over promises made to the international community. They, of course, are THE experts on lying despite promises made to the international community. Sounds to me like the Saudi's are growing impatient with Obama. They really want a US war with Syria. Has the US disclosed it's chemical stockpile, no nor will it. But it's ok for obama to fund al qeada and their sarin gas attacks. Apparently sir, while chasting others for being ignorant, you're missing the boat. SEVERAL sources, domestic and international have shown it was U.S. –sponsored Al Quada forces with the sarin gas. Then there was the email leaks dating back to early last year, etc... No sir, you're falling for the snowjobs then calling others ignorant who've obviously read more news than yourself. Wake up. Mean while the CDC plays and attempts to mutate different types of flu virus so they can estimate the capacity of mortality rates world wide. Why speed up a mutation progress that could take a few million years for nature to accomplish? More funding. I don't know... I'd say that "Retired" has facts and details on his side. Your oblique reference to "foreign and domestic sources" could mean people like Charlie Sheen. He is right about the US declaration and the storage sites in Umatilla, Oregon and the Johnson Atoll. Those are destroying our aging chemical weapons stockpiles. Also, back to al Qaeda, the US gov't and the UN both determined that Syrian forces had used chemical weapons. Neither has stated that al Qaeda (or any rebel forces) have. That's speculation without any substantive support. They may have done so, but there is no one on record saying that who is actually qualified to do so. It's none of our business. F America. I feel the same way you do, Korby. We have absolutely no business in Syria but try to tell that to right-wing morons in Washington D.C.! Right wingers were the war mongers until this admin. Now they have the brakeman's seat. This article is speculation and chem weapons are a red herring. Russia has not decided yet if they would go to war to protect Syria and the peace talks can't happen because Al Qeada won't attend. and Al Qeada is taking over and Israel wants to fight. And we have Europe at odds with each other and with us... if this isn't the set up for ww3, I don't know what is. I don't trust Syria, I don't trust Russia, but most of all I don't trust Iran. Putting aside the crisis in Syria, I think Israel will at some point in the near future take out Iran's nuclear program completely. The question is Russia's response which I think will be just verbal. I also believe they will neutralize any threat from Syria. Might as well add Barack Obama to the do-not-trust list. Not because he's dishonest but because he's hopelessly incompetent. Thank you, budwhite451. Spoken like another dimwitted Tea Partier who takes everything the U.S. government says as the Gospel Truth. Can you guys think for yourselves anymore? The right-wing fanatics in Washington are only looking for an excuse to attack Syria and eventually take over that country!!! Dead wrong, George. We didn't want to get involved in this in the first place. We have no friends on either side of the battle in this one. It was your messiah who wanted to sound tough with his "red line" BS. Then the amateurish "Let Putin handle it" philosophy. It has been mishandled at each possible step. Buffoonery. Don't you tired of throwing "the Tea party" card. Assad has been an enemy of us for years anyways. Taking him off the board would isolate Iran and leave us with one less enemy to deal with. Even if the next Syrian government was to hate us it would be to unstable to be much of a threat to anyone. Couldn't agree more. Thank God for Israel. The only country with the balls to do the right thing. Israel could take Syria, Lebanon, Iran, or any combination of Arab states because they have done it in the past. The only reason they don't is because they don't want to constantly fight with the Arabs so they just knock them down and walk away in order to prevent a much larger conflict to unfold. But Kerry and Obama said we're good. Surely we trust Putin and his buddy Assad. I'm shocked. Is there anyone over 16 that did not see this coming (other than Obama)? It was a bad idea to begin with. If someone shoots a lot of people with a gun, the solution isn't to take the gun away and leave him alone. The US and UN should have actually punished the Syrian dictatorship for their use of chemical weapons. Obama never proved that Syria's Assad used chemical weapons. Wht the White House asserted was supposedly the US sat on our cans for three days seeing a chemical attack taking form and we didn't do a dang thing about stopping it! We didn't tell the UN we didn't tell Assad to stand down, nothing! So at that point Obama allowed a chemical attack to kill 1400 (estimate never proven to be real) to happen. Didn't the world learn from Iraq not to secretly someday possibly threaten us? That's a clear act of war according to the Bush Doctrine. Obama might have to have Putin retrain Obama's rookies desire to start WW III. That's like saying "I think I doubt Iran". The "classified" intel that only CNN and 7.1 billion other people will have a chance to know of. It deserves to be well classified since our intelligence community evidently has the ability to see the future and know that Syria WILL hide chemical weapons. Wow were awesome. I wonder if Syria knows about this yet. Shhh. Don't tell them. It will be our little secret. Hopefully they are too backwards and primitive to understand Google "Syria+Chemical Weapons" Well time to shoot missiles at them I suppose. It's their own fault for doing bad things in our future. Syria is just as credible as Obama! After you shake Assad's hand, better count your fingers. Why does it seem that Obama is fishing around for any justification to mount a military strike against Syria. Looking for that opt out clause in the Russia/Syria deal. The US is in danger of becoming Saudi Arabia's lapdog since the Saudis have wanted the US to bomb al-Assad and bring about regime change. This allegation about al-Assad possibly not disclosing all of his chemical weapons stockpile could be an excuse for the US to do the Saudis' bidding and launch military strikes. Of course the Saudis have enough military hardware to do the job themselves but want for the US to accomplish it instead so that the Saudis will escape condemnation from other primarily Muslim governments. We should give them more weapons so that they can wipe each other out quicker. I am shocked, just shocked I tell you, that a Muslim dictator would not keep his word. Shocked. Most Americans agree with you. Nooooo really? Obama has been played for a fool since he took office. Yet another area where Obama administration is played for a fool. Drags the USA down with him. Somebody please start the impeachment process.No justification for delaying that action. Oh we need another NEW story to tell so OBAMA can dodge the ACA mess. Everytime he and his group screws something up the media will just find something else to report on. And YES can you smell a con job coming. I wish Odumbo would hire me, I could tell him what Bulls**t looks like! He SHOULD have been able to recognize it since he's the Master of it! Think about it.. if we could just carpet bomb Syria.. simply kill the entire population.. we wouldnt have read about this crap anymore.. silence would be golden... while the bombing is going on.. it would ne nice if we could maybe drop a few on ALL of their neighbors.. why disciiminate when killing millions of people.. let's just simply kill em all and let gd sort them out.. It is after all more efficient than actually knowing anything. Those who wish for and carry out mass destruction upon others have historically perished as an eventual result of the same. Who would have thunk it? Not Syria surely.